Cosmic radiation may give astronauts Alzheimer's, says study. Don't cancel your Mars tickets yet. 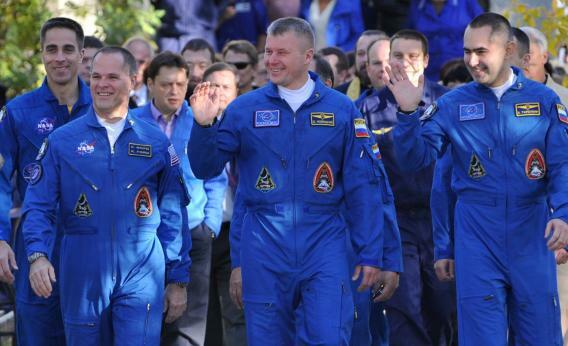 U.S. astronaut Kevin Ford and Russian cosmonauts Oleg Novitskiy and Evgeny Tarelkin prepare to head to the International Space Station. “In space I see things that are not there,” astronaut Don Pettit wrote last year from aboard the International Space Station, about 200 miles above Earth’s surface. When he saw flashes that looked like “luminous dancing fairies,” Pettit wasn’t losing his mind. He and other astronauts “see” radiation when it hits their retinas. Space is hostile to life not only because it is empty, but because it’s not quite empty enough. Radiation that endangers astronauts spurts through space in two main forms: galactic cosmic rays and protons ejected by the sun. Both sources of radiation are potentially dangerous to human life. Even though galactic radiation can be more energetic, the number of particles in a burst of solar radiation can be as much as 100 million times larger than the galactic background, which is much more immediately dangerous for astronauts. Pettit and his colleagues on the ISS are relatively safe, though, because they are orbiting within Earth’s magnetic field. Magnetic fields deflect charged particles that account for most of the radiation—both solar and galactic. Travel beyond low Earth orbit—to the moon or beyond—is much riskier. NASA, which has displayed an unsteady commitment to such exploration, has funded research in how to mitigate radiation risk in haphazard fashion in the past, according to a 2008 National Research Council report. The latest widely reported study to come out of NASA’s efforts was published earlier this week in PLOS ONE, a scientific journal. The study, done at the University of Rochester, claims that galactic cosmic radiation may lead to an increased risk of Alzheimer’s disease. But it is flawed in two ways that are indicative of what’s wrong with both NASA and with much modern medical research. So headlines like “Study: Space Radiation Could Cause Alzheimer’s” are true in a narrow sense: Space radiation could cause Alzheimer’s. But this study doesn’t establish that it does. The real news here is that overreliance on mouse models continues, as does selective interpretation of data. In this study, significant changes in the amount of brain plaque thought to contribute to Alzheimer’s were seen only in male mice—but there’s little discussion of the fact that female mice appeared relatively unscathed. All of the mice had been genetically engineered to be susceptible to Alzheimer’s, something not likely to be true of astronauts. Even so, irradiated mice performed differently to non-irradiated mice in only two of three simplistic cognitive tests. If we are to get to Mars, it’s best not to worry about mice that may or may not have somewhat increased amounts of brain plaque. Pettit, at least, knew he was seeing things that are not there. But he might not be the only one.